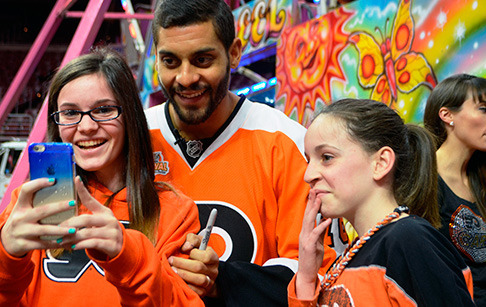 The Philadelphia Flyers have signed 6-0, 198 lb LW Pierre-Edouard Bellemare to a multi-year contract extension, according to general manager Ron Hextall. Bellemare, who turns 30 on Friday (3/6/1985), has collected four goals and four assists for eight points in 62 games this season. He came to the Flyers from Skelleftea AIK of the Swedish Hockey League (formerly Swedish Elite League), where he spent the past five seasons and posted a total of 64 goals and 61 assists for 125 points in 238 games. Bellemare played eight seasons overall in Sweden, spending three years with Leksands IF in Sweden’s second division before moving to Skelleftea in 2009. The native of Paris, France represented his country at the 2014 World Championships, where he recorded three goals and five assists for eight points in eight games. The Flyers return to action tomorrow night when they take on the Calgary Flames (7PM, CSN, 97.5 FM) as part of a homestand that continues Thursday when they host St. Louis at 7 PM. Tickets for both games are available by calling 215-218-PUCK or visiting philadelphiaflyers.com.